Polarn O. Pyret makes clothing that allows kids to roam, have fun and be safe out in the elements. It is a company of Swedish origin and plays on its Scandinavian heritage to great effect as it continues to provide customers with innovative and stylish yet sensible designs that are manufactured to last. The company actually started trading all the way back in the early 1900s when its founders sold baby products alongside medical products and tobacco. Polarn O. Pyret has been through countless changes over the years, but its dedication to quality and innovation remains strong. Polarn O. Pyret caters for babies through to pre-teenage adolescents. It stocks a massive range of clothing, shoes and accessories online including everything from thermal layers to nightwear and hats. The clothes are made to last, and are perfect if you like spending a lot of time outside playing with the kids. 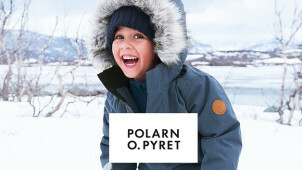 The weather-proof materials used in Polarn O. Pyret’s outerwear is really durable, breathable and designed to keep kids safe in case they get stuck in a tree or fall in a puddle. Polarn O. Pyret also has green credentials as it commits to 30% usage of organic or recycled materials in all its products. How do I use my Polarn O. Pyret voucher code? Sign up to the Polarn O. Pyret newsletter to be the first to hear about product releases, competitions and special offers. Can I write a product review for Polarn O. Pyret? Yes, you can do so using TrustPilot, every reviewer has the chance to win £50 in a prize draw. Why does Polarn O. Pyret use Klarna? Klarna is a Swedish payment service provider that takes end-to-end responsibility for your payment. It supports 60 million consumers worldwide in over 70,000 online stores and are very safe to use. Can I place a Polarn O. Pyret order over the phone? Yes, if you’d like to place an order over the phone, please ring: 01522 515715. There are a number of stores across the UK, so use the Store Finder tool to find out this info. Polarn O. Pyret sells clothes that keep kids warm, comfortable and on trend from birth to adolescence. If you have a Polarn O. Pyret voucher code, you should use it to stock up on essentials, footwear and outerwear while making amazing savings at the checkout. You can shop online by age range, full range, highlights or outlet. The outlet items are guaranteed to give you even more for your money! A great way to share your love for Polarn O. Pyret while cashing in on a great offer is to join up to the Recommend a Friend initiative. All you have to do is sign up, by filling in a few pieces of info on the Polarn O. Pyret website and wait for your friend to make their first purchase. Both of you will receive 30% off, when they shop with Polarn O. Pyret, so it’s well worth sharing the love! We all know the British weather can’t be trusted, even at the height of the summer, which is why you should look at the superb Outerwear collections at Polarn O. Pyret. Make great savings when you use a Polarn O. Pyret discount code to purchase a new water, wind and snow resistant jacket for your little one. Pyret uses the best Scandinavian design and innovative technology to craft outerwear that keeps kids warm and comfortable so they can spend more time outdoors exploring - whatever the weather.